We’d love your help. 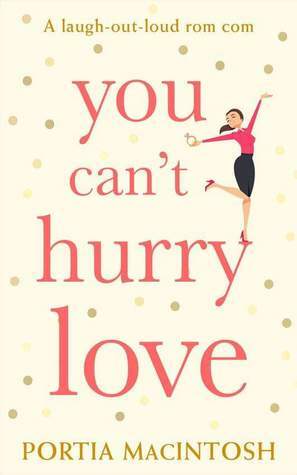 Let us know what’s wrong with this preview of You Can't Hurry Love by Portia MacIntosh. ‘Delightfully romantic, light-hearted and charmingly entertaining.’ What’s Better Than Books? Mia Valentina gave up her high-flying life in LA to move back to Kent over four years ago. But it turns up that life in the slow lane isn’t all it’s cracked up to be! So when her boyfriend Leo proposes, she says yes, hoping it will bring some much needed sparkl ‘Delightfully romantic, light-hearted and charmingly entertaining.’ What’s Better Than Books? To ask other readers questions about You Can't Hurry Love, please sign up. Heartwarming, amusing, and positively enchanting! How Not to be a Bride is a lighthearted rom-com full of heart and humour that reminds us that life is often full of pressures, challenges, misunderstandings, and surprises and sometimes all we need to do to find happiness is communicate, compromise and find balance. The writing is crisp and witty. The characters are flawed, lovable, funny and sincere. And the plot sweeps you away into the lives of Mia and Leo as they learn the importance of being t Heartwarming, amusing, and positively enchanting! The writing is crisp and witty. The characters are flawed, lovable, funny and sincere. And the plot sweeps you away into the lives of Mia and Leo as they learn the importance of being true to one's self, family, friendship, trust, acceptance, and unconditional love. Once again, MacIntosh has written a novel that I truly adore. How Not to be a Bride is wonderfully entertaining, enjoyable and has a storyline that will make you laugh, smile and most definitely leave you wanting more. Thank you to Portia MacIntosh and HQ Digital for providing me with a copy in exchange for an honest review. How Not To Be a Bride was a nice and enjoyable story,the words flow and the plot development kept me glued to my kindle. This is my second Portia MacIntosh's book but she easily became one of my favourite romantic comedy author. Following Mia journey from her boyfriend's proposal to her walk down the aisle was a whirlwind of feelings,I laughed at most of her predicaments and I have shed few tears too. I could definitely feel her love for Leo and her excitements at the prospect to have him in her life for ever but at same time I could see how she was drowning under her family's expectations and the monotony and the loneliness of her writing job. I only met these characters in this novel,sorry I've to catch up to the previous installment,but it didn't feel like I was missing something. -raises hands up to the sky in the hallelujah pose-. YAS!!!! I am a huge fan of Portia MacIntosh’s work. Her laugh out loud approach to real life situations is not only refreshing, it’s also weirdly heart-warming. MacIntosh takes situations (which some of us hide behind closed doors at, crying our eyes out with no idea of where to go from here) dissects them until they’re unrecognisable, and then coaches her characters to get through the emotional times – bit by bit. It’s pretty much like therapy. Except it’s a smudge of the cost and makes you laugh instead of crying out; ‘I DON’T KNOW WHY I’M HEREEEEEE’. So, the burning question – did I enjoy ‘How Not To Be A Bride’? Oh hell yeah I did! Guess who’s back, back again -shimmies-. The author’s iconic writing style had returned in her latest offering, and what a belter of a book for it to return in! If you’re thinking that every woman in the world has been planning their wedding since they were an embryo; think again. If you’re thinking that every engaged woman wants the big, white wedding with added meringue (the dress, not the dessert), then you’ve obviously not been watching enough ‘Say Yes To The Dress’! Mia is the voice of every woman out there who just wants to get married simply. No fuss. No fluff. No having to say yes to things she doesn’t want but is railroaded into agreeing with. I guess some readers might find Mia’s approach to her wedding a little unorthodox. I however, found it to be extremely refreshing, whilst also finding out that I should be a bobbly head/nodding dog in my next life – due to all the agreeing I was doing. The main relationship in this novel is brilliant as it shows the two characters being just like every other couple out there! Couples who don’t communicate! I shouldn’t laugh, but I made my sides hurt from laughing when Mia decided to ‘go and feel young again’. Brilliant. I love, love, LOVED this book. The whole storyline was written brilliantly and I managed to finish it in one sitting (obvs) it was that addictive! I loved how the characters lifestyles pulled me in from the very first page, keeping me hostage until the very last page. Now, seeing as the calibre of this novel is 100% Portia MacIntosh and FABULOUS, I didn’t really mind being kept hostage to be honest! Not a sentence I thought I would say, but oh well! ‘How Not To Be A Bride’ is a laugh out loud, warm, refreshing novel which is guaranteed to make you curl up on the sofa with, whilst also feeling like you’re gaining a 2D BFF in your PJs. Win-win! It’s modern, it’s relatable and it’s absolutely brilliant. Another fantastic novel from such a brilliant author. Well the title is not wrong, if you want to find out how to be the perfect bride for a big white wedding then you are looking in the wrong place. If you are wanting a fun romantic comedy about real people that aren't quite sure what they want or how to act then this is the book for you! This is a typically amusing Portia MacIntosh book, incredibly funny and transports you to between the pages of the book for a few hours while you read it. Pure escapist fun and frolics. Now who doesn't want to re Well the title is not wrong, if you want to find out how to be the perfect bride for a big white wedding then you are looking in the wrong place. If you are wanting a fun romantic comedy about real people that aren't quite sure what they want or how to act then this is the book for you! Now who doesn't want to read a book featuring a hot fireman, who appears to be the perfect boyfriend. Leo is wonderful and I'm just a little bit in love with him myself. Then there is rockstar Dylan who I ended up having a real soft spot for, as we learn his personal revelations and he is the subject of Mia's latest job. What I did find frustrating was Mia and her constant comparisons of her LA life from before she met Leo, to her current life. She is a lovely girl but just can't seem to see what she has in front of her. All aspects of her life seemed pretty great to me and I did like her as a character, just wanted to knock some sense into her on occasion. What really made me laugh is Mia's extended family, they sound like a complete nightmare, and I know how she feels. Doesn't seem to matter what she does there is someone around to upstage her, criticise her or blame her. As I've been writing this review I have just checked the blurbs of a couple of this authors previous books and its confirmed a suspicion, that if you have read some of her earlier books then there are some recurring characters in this, and made me realise I really should read those books that are lurking on my kindle! This is a really enjoyable romantic comedy that really made me smile. Mia Valentina gave up her high-flying life in LA to move back to Kent over four years ago. But it turns out that life in the slow lane isn’t all it’s cracked up to be! Having loved previous book by Portia MacIntosh, I knew this new offering wouldnt be a disappointment. We meet Author Mia Valentine, Mia used to live in LA but moved back to Kent to be with boyfriend Fireman Leo. When Leo proposes, Mia isnt too sure if its what she wants but decides to get on with the wedding plans in the hope it will take her mind off how boring her life has become in the UK. While most brides to be are thinking of huge white weddings and the full works, Mia just wants a simple fuss free wedding with no interuptions. Mia was refreshing and easily likeable. There were some great supporting cast, I especially liked Mia’s Grandad. This book was quite funny! It was refreshing to read about a down to earth woman who wasn't obsessed with weddings and all of the hassle that comes with it. Mia is so funny and likable that i couldn't put the book down. I would definitely 're read this book! I am a huge fan of Portia MacIntosh's novels and I was so looking forward to reading "How Not to be a Bride" - already the title made me smile and I really hoped that it's setting the mood for the rest of the story. And I absolutely got the fact that Mia didn't want to get married - I have never dreamed about fluffy bouncy wedding dress and only thinking about the first dance and all those traditions that are mandatory at the wedding made me cringe, and big weddings are a real nightmare for me, so yes, Mia, I know what you meant - when married, then in the simplest way! Portia's writing style is, as usual, easy and light - hearted and this was a quick read full of great one - liners. A story about making decisions, small and huge and realising what it is that you want from your life. It was refreshing and of course brutally honest, but in a funny way, filled with situations all of us can relate to, cringe with embarrassment and whisper "I've been there, I've seen this". My only problem with this book were characters, I couldn't warm to them and probably I didn't "get" them enough to enjoy them more. I really wasn't sure about Mia, if she truly knew what it is she wants. The more I read about her relationship with the wonderful fireman Leo (her words, not mine. I personally didn't think Leo is wonderful), the more often I was asking myself the question why she's with him at all, is he the right person for her. I was starting to ask myself if they really are destined to be together, if there really are chances for them to be happy and wondering why are they together at all. There was something that was not working for me in this relationship and it bothered me the whole story. "How Not to be a Bride" was filled with ups and downs of everyday life and problems, full of troubles in paradise and jumping to conclusions, and this all brought to us in a great, light way. There was all the time something happening in this story and I think it's great, as it kept me glued to the pages and I truly wanted to know what's going to happen and what kind of troubles is Mia going to get herself. Mia has her dreamed job and a charming boyfriend, but she still misses her oh-so-amazing life in LA. When her handsome boyfriend (Leo) asks her to marry him all of her fears return to her... is she ready to marry Leo? Mia loves her boyfriend, she left LA to stay with him... but everytime anyone asks her about the wedding she feels compelled to change subject. It's because she is not yet ready for it or because she really doesn't want to marry? I could understand the fear of weddings, I never dream Mia has her dreamed job and a charming boyfriend, but she still misses her oh-so-amazing life in LA. When her handsome boyfriend (Leo) asks her to marry him all of her fears return to her... is she ready to marry Leo? I could understand the fear of weddings, I never dreamed about it and when it was my moment I didn't know what I wanted or if it was something I really wanted. Weddings are not for everyone but sadly not everyone can understand it...! While Mia tries to confront her fears and has a bit of remember of what it was being near famous people and have a lot of money, we will meet her not very nice family (I am still not sure which one of them is worst with Mia), her lovely (and handsome, very handsome) boyfriend and her new job, the famous star Dylan. Let me say that none of them helps Mia, on the contrary, they make her being more scared of marriage if its possible. I didn't like very much Mia's character in the beginning, she is very superficial and not very interested in discovering what's really behind the appearances, but as the book progresses, her character seems to grow and being more touching with all the people near her. This was a quick and funny read, perfect to make you smile on your worst day, and to make you remember that if you share your fears, they loose the power to you and you gain confidence! I do love Portia Macintosh. Her heroines are often struggling with something and it's usually something that women are expected to embrace as part of our “make up”. My last MacIntosh read had a main character who didn't get along with her in-laws and had to spend a weekend under their scrutiny. This novel has our modern leading lady feeling pressure to plan a big white wedding to go along with her engagement. Trouble is that she's just not that kind of girl and it takes her the entire novel to work out that she wants to be married but not have a wedding. MacIntosh characters are instantly likeable and Mia is no exception. And though I occasionally found the first person voice a bit detached, I was still engaged in her journey of self-discovery. Her man is delightful, sweet and thoughtful and there's nothing to complain about from the reader or Mia. Her pressure comes solely from her meddling mother and sister. I couldn't find a redeeming quality in either of them, even at the end. I was actually most disappointed that they didn't come good in the end- they were still mostly rotten and I don't blame Mia at all for her detachment. The unlikely friendship between Mia and Dylan was fun and added laughs to an otherwise stressful period in her life and I was particularly amused by the cake tasting scene with the prudish wedding coordinator. Overall the story comes together happily and everyone ends up in their rightful place. A lighthearted read! Mia is the main character in 'how not to be a bride', when we join her she is living with Leo a hunky fireman in their house that needs gutting which is a million miles away from her American life. Leo proposes to Mia and although she says 'yes' with no doubts they start to creep in over time through some of the bad choices she makes. Mia is a writer so stays at home and feels she's missing out on the social side of work life so to help fund the house and the wedding she sets off to find an extr Mia is the main character in 'how not to be a bride', when we join her she is living with Leo a hunky fireman in their house that needs gutting which is a million miles away from her American life. Leo proposes to Mia and although she says 'yes' with no doubts they start to creep in over time through some of the bad choices she makes. Mia is a writer so stays at home and feels she's missing out on the social side of work life so to help fund the house and the wedding she sets off to find an extra job. She starts to flap over her wedding when she finds that no-one wants to be her bridesmaid in her family, her mother organises a wedding planner that she never wanted and she starts ghost writing a famous persons autobiography that takes her back to her American life in a way and makes her question what she's doing. This was a funny read and Mia is a bit of a one for making wrong choices and getting herself into a pickle but I did like her as a main character, I started off thinking Leo was too good to be true but I was wrong but he at times was a bit of a whittler but maybe I would be if my fiancé was going to parties with a rock star whilst I was at home!! This was a light hearted read that I did enjoy and thought the ending was great and would definitely read more by Portia Macintosh. If you have ever read a Portia MacIntosh book you know that you will get down to earth characters who feel like you could genuinely know. Along with a story that will completely wrap you up in the storyline all the way to the end. How Not to be A Bride is exactly that and it felt so easy to be pulled into Mia's life along with the ups and downs that she experiences along the way. It was really refreshing to meet a character who wasn't obsessed with weddings or even remotely hoping for an engagem If you have ever read a Portia MacIntosh book you know that you will get down to earth characters who feel like you could genuinely know. Along with a story that will completely wrap you up in the storyline all the way to the end. How Not to be A Bride is exactly that and it felt so easy to be pulled into Mia's life along with the ups and downs that she experiences along the way. It was really refreshing to meet a character who wasn't obsessed with weddings or even remotely hoping for an engagement ring from her boyfriend. I guess in a way it made Mia stand out just that little bit more. The story is written in a way where I couldn't help but laugh and smile along at some of the situations. I could understand Mia's reluctance of having the dream big wedding I never wanted that for myself. I hate being the centre of attention so to have so many eyes on me would be my worst nightmare. The fact that Mia and Leo are an established couple really made this story extra special for me it was almost a story of what happens after the happy ending. When real life and other issues crop up making it feel so realistic in that sense. A special mention has to go to Mia's granddad I loved how he was always on Mia's side and just loved her for who she is. A heart warming story that will leave you smiling away to yourself long after you have put the book down! How Not to be a Bride is a fabulously sparkling fun read with an underlying message: do you get married for the wedding - or the marriage? Mia and Leo are totally and madly in love, but outside influences don't make the ride an easy one - a house which takes all their time and money, madcap neighbours, Leo's shift pattern as a fireman, Mia's lack of a regular income - and that's without mentioning her overbearing and interfering family (which rang a very loud bell for me). All of these add up to How Not to be a Bride is a fabulously sparkling fun read with an underlying message: do you get married for the wedding - or the marriage? Mia and Leo are totally and madly in love, but outside influences don't make the ride an easy one - a house which takes all their time and money, madcap neighbours, Leo's shift pattern as a fireman, Mia's lack of a regular income - and that's without mentioning her overbearing and interfering family (which rang a very loud bell for me). All of these add up to a level of stress which is only just bearable .. and then Leo proposes! This is my first Portia MacIntosh read and I look forward to searching out more of her novels. Great well-rounded characters, fabulous writing, travel, personal dilemmas, jealousy, family relations and, most importantly, love all make this a very easy to read rom-com of the highest calibre. And it's so funny! Definitely a book and an author which I recommend. Trust me, this will lift your spirits and make you smile. Five sparkling gold stars without a doubt. How Not to Be a Bride is such an enjoyable read! I loved reading about Mia, her life as a writer, and her relationship with Leo. And, I honestly wasn't sure how this book was going to end! While Portia Macintosh never threw out any true curve balls, there was enough doubt about Mia and Leo's relationship to keep me engaged to the last page. My only complaint about this novel is that it got a little repetitive at points. I think it would have been better if a few pages about how great Leo is were How Not to Be a Bride is such an enjoyable read! I loved reading about Mia, her life as a writer, and her relationship with Leo. And, I honestly wasn't sure how this book was going to end! While Portia Macintosh never threw out any true curve balls, there was enough doubt about Mia and Leo's relationship to keep me engaged to the last page. My only complaint about this novel is that it got a little repetitive at points. I think it would have been better if a few pages about how great Leo is were removed! OH MY GOSH I loved this book!! I laughed out loud so many times during reading this that I was sure people were going to think I was crazy. Mia, the main character, was so funny and I felt for her so many times. This book is an honest look at the pressure put on modern day brides to throw the perfect, lavish wedding. It shows how quickly things can escalate when a bride's feelings are not considered, and family thinks they know what's best. I cannot recommend this book enough! This book was so good!! I was literally laughing out loud at times and I adored the writing style used, so perfect for the story and it made it such an easy read!! 2.5 stars. Okay read - not bad, not super good but okay in a “reading by the pool” kind of way. For me, the book really kind of began when Dylan came into play and that was (I think) 40 % into the book. Mia is okay (kind of bored me with the whole “LA Mia/old mia”), Leo is (a bit too) perfect, her family is somewhat horrible. Dylan was the most interesting character and I liked the development of his and Mias relationship. What a great book. While reading this book I was kinda thinking I could tell how it was going to end by the title and the blurb. By the time I started getting into the middle of it I thought "Damn I'm right about yet another book" but when I actually finished the book my jaw had dropped because I was so so very wrong in such a good way. The main character, Mia, gives up a glamorous life in LA to move back home to Kent and soon after her gorgeous, firefighter boyfriend proposes. Mia comes across as spoiled, self-centered, and not very likable. The attempt at humor was a bit juvenile for my taste but seems to appeal to many. I was provided with an ARC by the publisher in exchange for an honest review. I have never read a book by this author & have had this sitting on my kindle for a while. I'm so glad I decided to read it. It had great characters, a few twists to throw you off track and some funny moments. Really enjoyed this light chic lit. It was funny, heartfelt, sad, everything. I’d love to be Mia 🙈. If you are struggling with wedding planning or even the idea of a wedding, you aren’t alone, give this a read. Mia Valentina just got engaged to Leo, her boyfriend of four years, but her happiness is disrupted by the many things going on in her life. She misses her old life in Los Angeles; her house is an ongoing construction site; her mother hired a wedding planner without consulting her; no one wants to be her bridesmaid; she barely sees Leo who is working overtime as a firefighter; and she is ghostwriting the biography of a rock star who is often drunk. As the Christmas holidays loom and the pressure Mia Valentina just got engaged to Leo, her boyfriend of four years, but her happiness is disrupted by the many things going on in her life. She misses her old life in Los Angeles; her house is an ongoing construction site; her mother hired a wedding planner without consulting her; no one wants to be her bridesmaid; she barely sees Leo who is working overtime as a firefighter; and she is ghostwriting the biography of a rock star who is often drunk. As the Christmas holidays loom and the pressure for the wedding becomes too much, Mia makes a series of bad decisions that make her wonder why she is not as excited as everyone expects her to be. DNF @ 24%. I hate quitting a book but YIKES. Honestly, Leo was sweet but really high maintenance and needy. Mia's family is vicious. Dylan is hilarious and honestly, while some of this book seemed to drag, over all t was entertaining. One of my favorite novels from Portia Macintosh is Bad Bridesmaid (reviewed here). Mia Valentina is a character that sticks with you, so I was thrilled to discover that her story continues on in How Not to be a Bride! We discover that Mia has chosen to to leave her life behind in sunny California, and start a new one with her gorgeous man, Leo, in Kent. And while that’s all well and good, it also means living closer to her family, who have always caused a lot of contention and chaos in her world. I felt pretty annoyed by them in the past, and it seems as though they’ve calmed down just a touch, but they’re still meddling and at times, downright obnoxious, which makes for some really great tumultuous relationships and scenes between all involved. Even through all of that, I could still feel the love that’s there, just beneath the surface, and I imagine it’s wanting to make sure Mia makes the right choices and lives the best life possible, that propels this family to try their damndest to keep her on the straight and narrow. With that comes the realization that Mia has given up so much of herself to stay in Kent. I feel as though Portia did a wonderful job of showcasing what it’s like when someone makes such a drastic change in their life. I could really relate and identify with what Mia is going through, and I imagine most of us can, because so many of us have been where she is, where we go a different route in life in order to make everyone else happy. In doing so, I felt as though she lost some of what makes her sparkle, and it’s so beautifully laid out in great detail. This lends into a lot of contention with Leo, who doesn’t seem to understand the sacrifices Mia has made for him and really, everyone else. So, the question becomes, should Mia continue to sacrifice and quelch who she is, or should she bring back some of the sass and sparkle that makes her who she is, and at what cost? Will it damage what she has with Leo? As always, the prospective is always honest and real, and I felt like Mia is a flawed, believable character, along with the others who are in her circle. I could see a lot of growth within her, a maturing that helped make her a lot more relatable. lunchtime cocktails, Portia just loves telling tales. powers for good and started writing novels instead. quite have her life together yet.